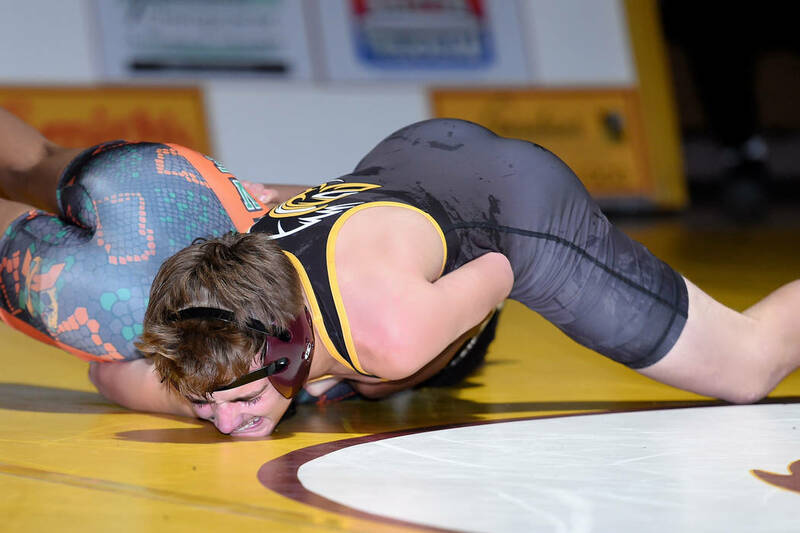 After sitting out the first six weeks of wrestling season, Pahrump Valley High School junior 120-pounder Donnie Miller was eager to get back on the mat. Peter Davis/Special to the Pahrump Valley Times Pahrump Valley junior Donnie Miller takes control of Mojave's Jaylen McGee on his way to a 15-6 major decision in their 120-pound bout Thursday night in Pahrump. Peter Davis/Special to the Pahrump Valley Times Freshman Henry Amaya first-period pin of Joseph Lojero at 132 pounds Thursday night gave Pahrump Valley a 28-0 lead over Mojave in their Sunset League match in Pahrump. 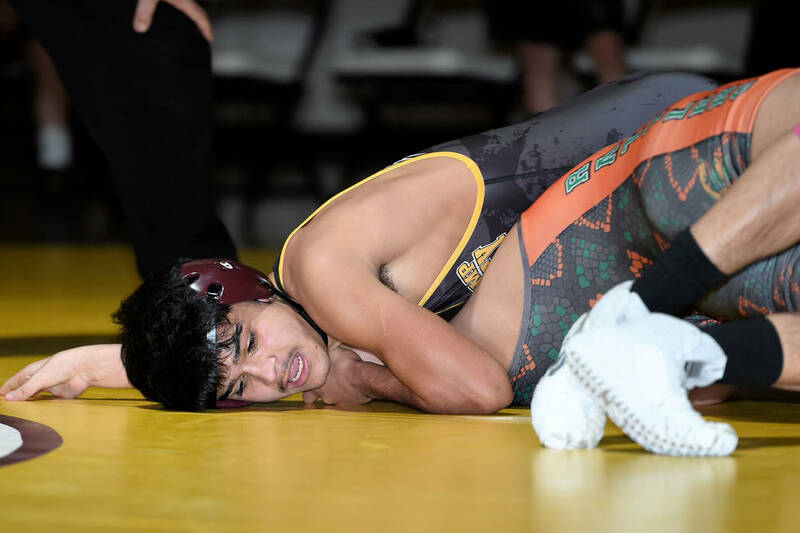 Peter Davis/Special to the Pahrump Valley Times Pahrump Valley senior Tristan Maughan pinned Mojave's Andrew Juarez in 3 minutes, 10 seconds, at 160 pounds during the Trojans' 55-21 victory over the Rattlers on Thursday night in Pahrump. Peter Davis/Special to the Pahrump Valley Times Sophomore Dylan Wright nears a pin of Mojave's Mekhi Brown during the first period of their 182-pound bout on Thursday night in Pahrump. At the end was when Miller was at his best against the Rattlers. Miller and junior Jaylen McGee were locked in a tight battle, with McGee taking a 2-1 lead after the first period. Starting on top in the second, Miller recorded two near-fall points, but McGee managed an escape and a takedown to take a 5-3 lead. Stalling calls made it even going into the third. But the third was all Miller. Tied at 6-6 in the final minute, Miller took over, getting a takedown and twice coming close to recording the pin. But the six near-fall points were enough for a 15-6 major decision that gave the Trojans a commanding 16-0 lead. “Two days ago I had the stomach flu,” Miller said. “I think I did all right for not really having the conditioning yet. The Trojans won the first seven bouts, including two forfeits and three falls, to lead 37-0 before the Rattlers got on the board. In fact, from 152 on, the Rattlers actually outscored the Trojans 21-18. Rieger also was impressed with several of his wrestlers, noting that Isaak Cruz at 145 and Tristan Maughan at 160 were both solid on their feet before recording pins. But he seemed especially happy to see successful outings from seniors Spencer Lane at 138 and Christian Monje at 220. Lane, in his first season on varsity, was dominant against Marcos Salas, winning by a somewhat deceptive 4-0 score. “I went out there and he tried to shoot on me, and I stuffed his head into the ground,” Lane said matter-of-factly. “I was trying to work my move. My move is the chicken wing, and I was working it and working it. He’s a really strong guy, but I kept working it, and at one point I almost got my chicken wing on him and I got a few points from that. Salas chose bottom for the second period, and Lane went back to work. Lane said the third period was similar to the second. “Almost the same thing happened, but this time I almost got a half-nelson on him,” he recalled. “I almost had him pinned, but he got out of it. Luckily, I got him back on his back. And soon enough the round ended. A few bouts later, Monje was showing off the effects of improved conditioning. As for the bout, Monje said it was pretty straightforward. “Knowing when to throw him, positioning him good and just catching him when he wasn’t expecting it,” said Monje, who was tied 2-2 with Service before he closed in on the fall. Monje also is acutely aware of how fast the wrestling season goes by. “Every league match counts for our seeding for regionals, and it helps you get to state faster if you get more wins,” he said. In wrestling, individual records in Sunset League matches will determine where each wrestler is seeded in the Class 3A Southern Region tournament Feb. 1-2 at Moapa Valley High School in Overton. 103: Mason Prunchak (PV) won by forfeit. 112: Garrett Cosper (PV) won by forfeit. 120: Donnie Miller (PV) major decision over Jaylen McGee 15-6. 126: Coby Tillery (PV) pinned Jayzen Cabbab 2:22. 132: Henry Amaya (PV) p. Joseph Lojero 1:16. 138: Spencer Lane (PV) decision over Marcos Salas 4-0. 145: Isaak Cruz (PV) p. Jayson Asas 3:23. 152: Treyton Keller (M) d. Dylan Grossell 8-2. 160: Tristan Maughan (PV) p. Andrew Juarez 3:10. 170: Sabastiem James (M) p. Ty Hansen 1:35. 182: Dylan Wright (PV) p. Mekhi Brown 1:18. 195: Anthony Jones (M) p. Anthony Pearson 3:24. 220: Christian Monje (PV) p. Nicholas Service 1:46. 285: Ivan Parra (M) p. Ronald Cross 3:39.